Researching jet cards lately? Looking into what each company has to offer and finding yourself overwhelmed with information? There are several leading companies that offer jet card programs, and like any investment, you want to do your homework before choosing the right one for you. Does my jet card guarantee Wi-Fi? 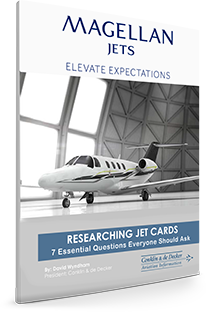 David Wyndham, President of Conklin & de Decker, has combined the 7 most essential questions everyone should ask when researching jet cards. This whitepaper will be your #1 resource when finding the program that fits YOUR needs!